it was an early day for us. up at 4am, left the house at 5:30am, picked up the rest of our pack at 6am, then we were off! somebody suggested an alternative route via marcos highway kasi traffic sa kennon road due to repairs. juice ko 11am na nung makita namin ang "welcome to baguio city" sign. but it's all worth it once you enter camp john hay and get the feel of the old baguio—hilly, zigzaggy roads, fog, fresh air, and a forest of pine trees. forget about session road, it's like being back in manila, ugh! we've posted before about staying at the manor. we had a gift certificate, which was expiring this week, so it was our last chance to use it. well, it must be this mercury in retrograde thing because when it was check-in time, we realized we forgot the GC at home! tanga!! (remember what happened to us in clark/subic a month ago??) buti na lang the PRs were there to save us (thank you, rosary and ika!). thank you and thank god. 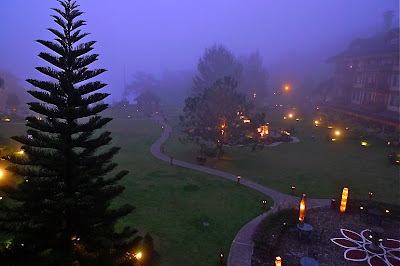 there's nothing better than sitting in the balcony of your room at the manor at camp john hay overlooking the garden with the fog rolling in while drinking wine and, er, blogging—hey, wifi is free! weelaveett!! !